We were lucky last year to get Circus in the Parks at Commercial Park and will have it for at least one more year: Oct. 6 & 7. It is an incredible two-hour performance with top-notch performers from as far as Montreal and Europe. Last year we sold out two of our four weekend shows and expect to sell out this year. Ticket proceeds are split between seven participating parks for improvements. Commercial Park's advisory council, for which I have volunteered for the last eight years, offers free weekly programs such as gardening, storytime, art sessions and free annual holiday parties. We strive support park staff in improving Commercial Park at 1845 W. Rice St. plus three local playlots; Snowberry (Huron & Wolcott), Superior (at Hoyne) and Honore (just north of Iowa). While Commercial has a new playground as of 2008, the three pocket parks need help. Please give back to your community by attending and sharing show details with anyone who wants to see an incredible show here in your neighborhood. 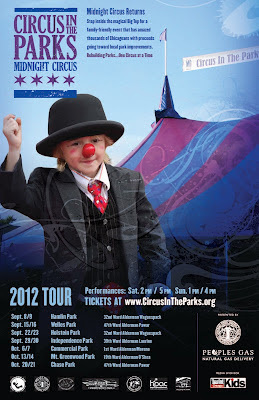 Tickets are available at CircusInTheParks.org.